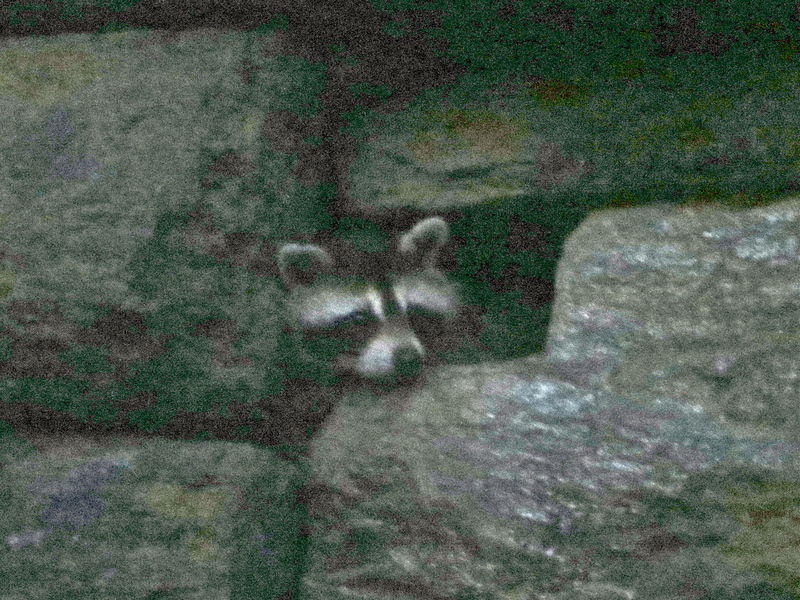 Last night at dusk, the great retaining wall of Riverside Park was crawling with raccoons. 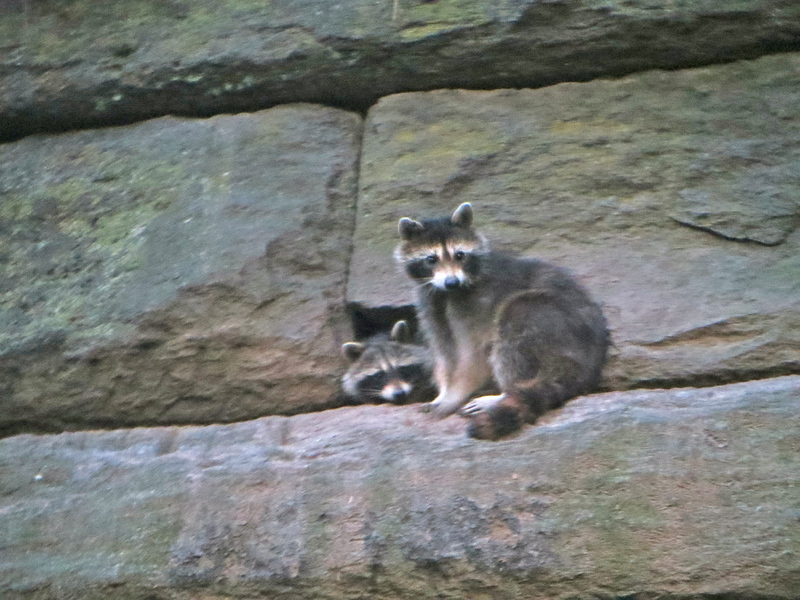 A mother raccoon (right) and her babies on the retaining wall in NYC’s Riverside Park. This is the same den I’ve been watching for years now. In 2009 or 2010, before the raccoon rabies epidemic hit, I once saw six raccoons emerge from this den, like clowns from a clown car. 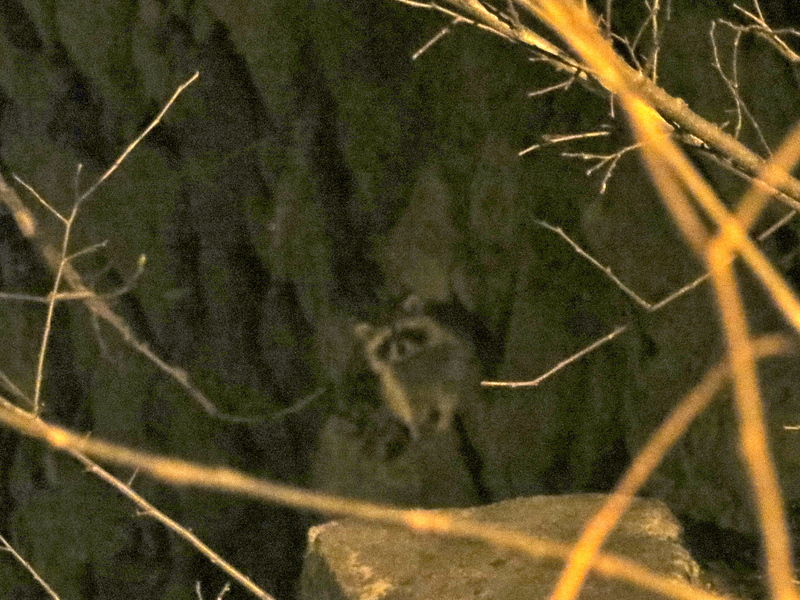 Last night, seven racoons climbed the wall. Seven! 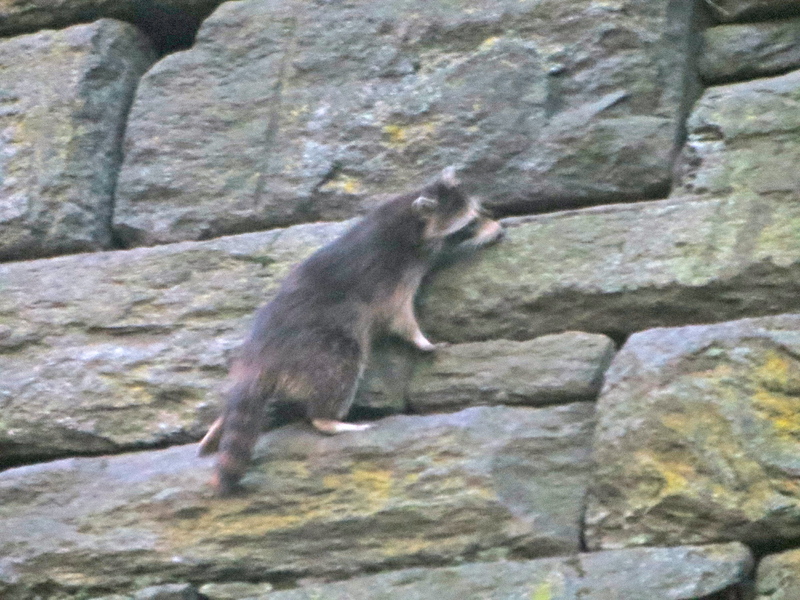 Back in early April, I watched a mother raccoon carry a baby along the wall, clearly looking to move it into a new den. My guess would be that this is the same mother with her litter now old enough to be exploring the world under her supervision. 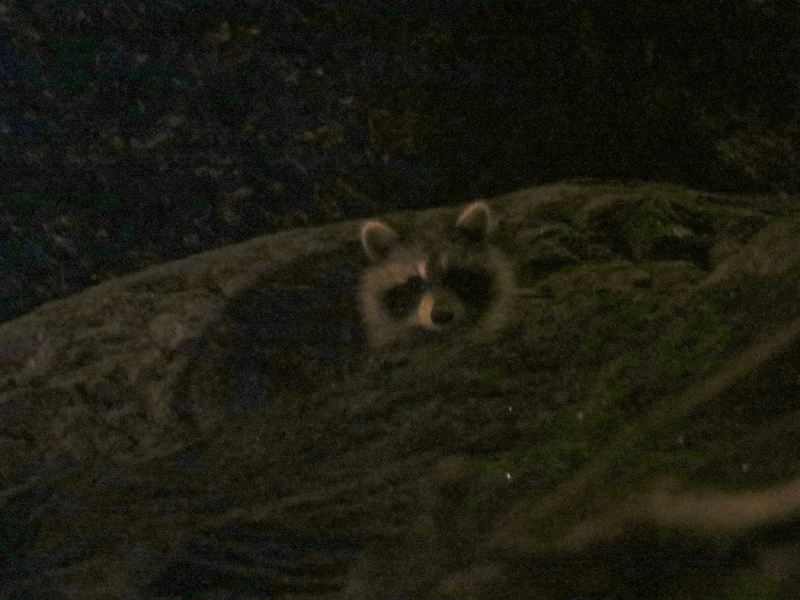 A small crowd had gathered to watch and photograph the raccoons. Usually, the raccoons on the wall go unnoticed. But the sheer number of animals moving on the wall attracted attention. 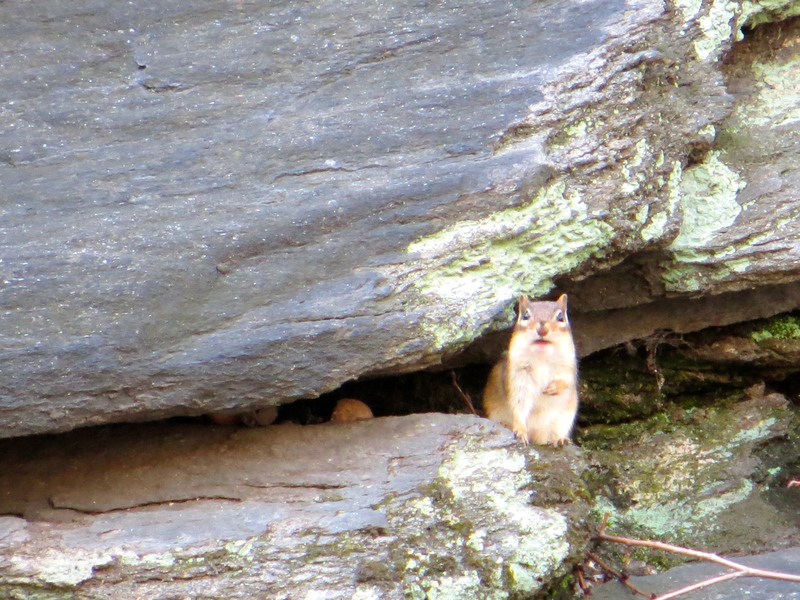 As they made their way along the stones, they popped in and out of various hidey-holes. 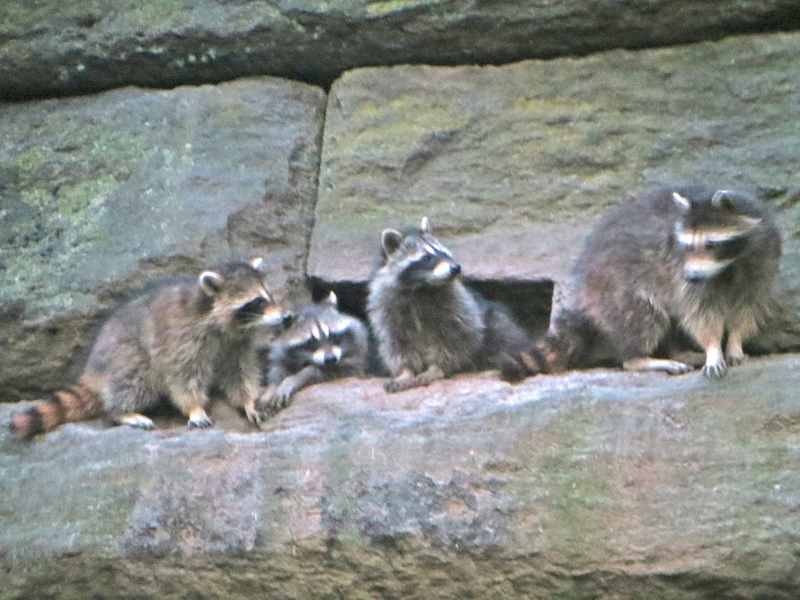 Personality differences among the raccoons seemed evident. One, in particular, seemed reluctant to leave the safety of the den, peeping out and retreating several times even as the others had already moved out along the wall. 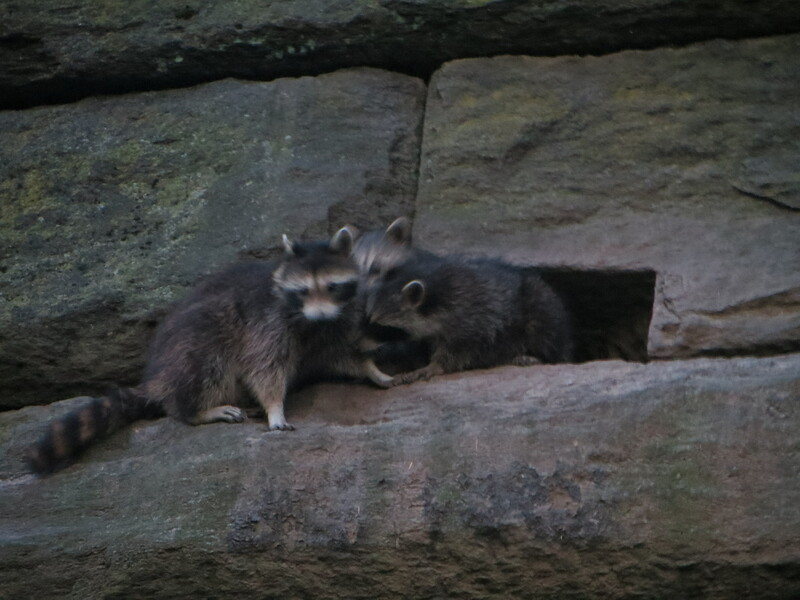 Some observers reported that in addition to the mother and babies, there was a “medium-sized” raccoon. They wondered if they were looking at a mother and father with a litter. This is highly unlikely, as male racoons don’t stay around after mating to help raise the young. In fact, adult males will often harm young raccoons. It’s more likely that the medium-sized raccoon is a juvenile from last year’s litter that is still living with the mother. 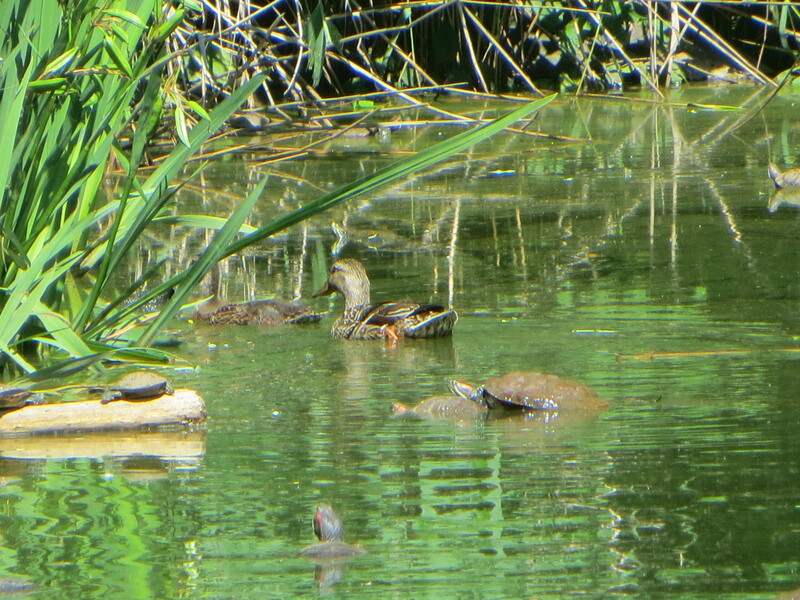 I’ve watched a mother care for, and wash, her slightly older babies here in August 2011. If this is indeed the case, then there may be five babies, which fits the average raccoon litter size of 2-5 kits. The little kittenish fellow in the picture below is following after its mother, but still uncertain of its footing on the wall. Apologies for the blurry, grainy photos, but it was quite dark. I’ve enhanced most of these photos to make the images clearer. Baby raccoon trails mother back to den. Below, two babies greet their mother as she returns to the den. 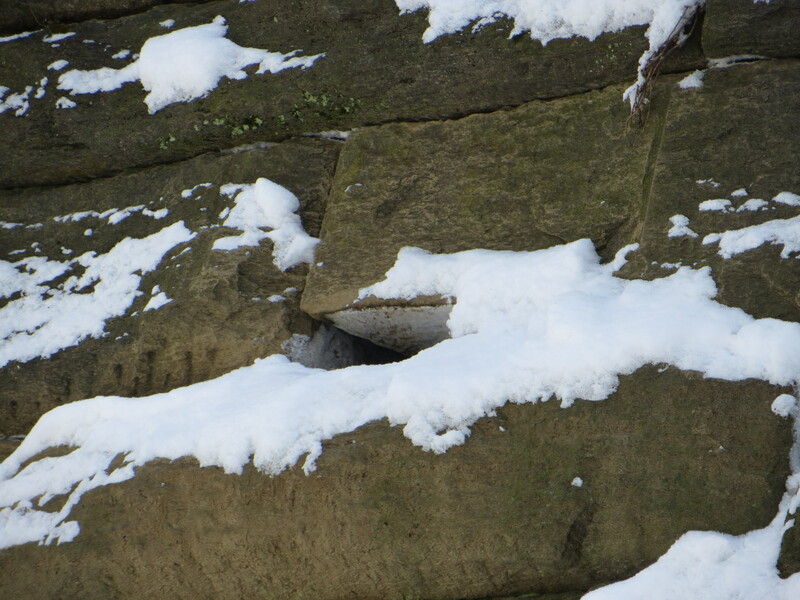 Here a raccoon peeps out of a hole a little north of the main den. Could this be the same hole where I heard growling that night in April when the mother ducked inside with the baby in her mouth? Or is this another baby? 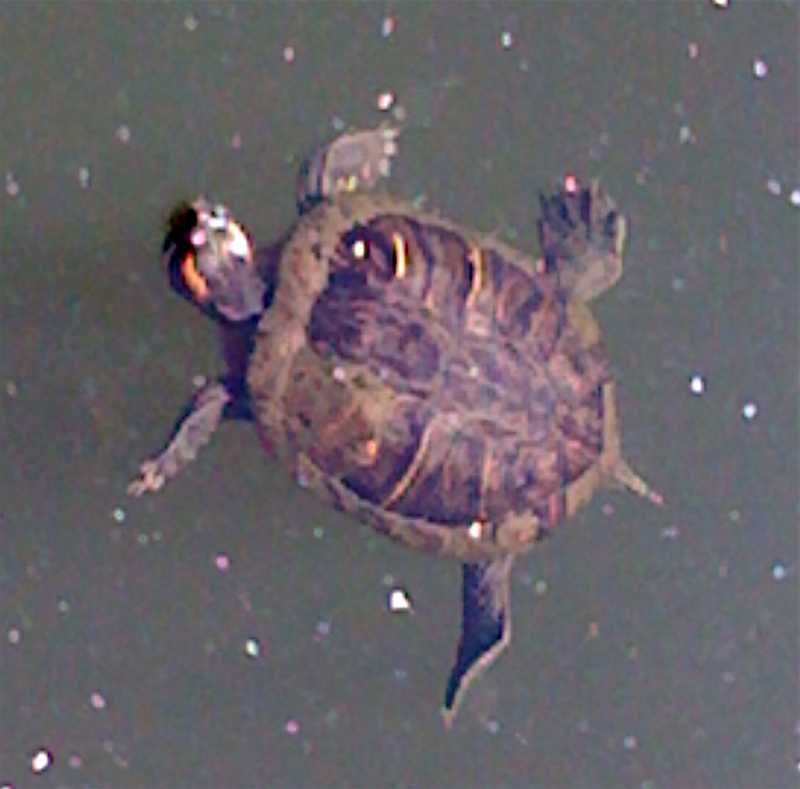 Or another juvenile? Size is difficult to estimate from a distance, so … hard to say. In any event, this individual stayed put while the others were on the move. Here is a video of the mother waiting with two babies while a third makes its way along the wall to join them. 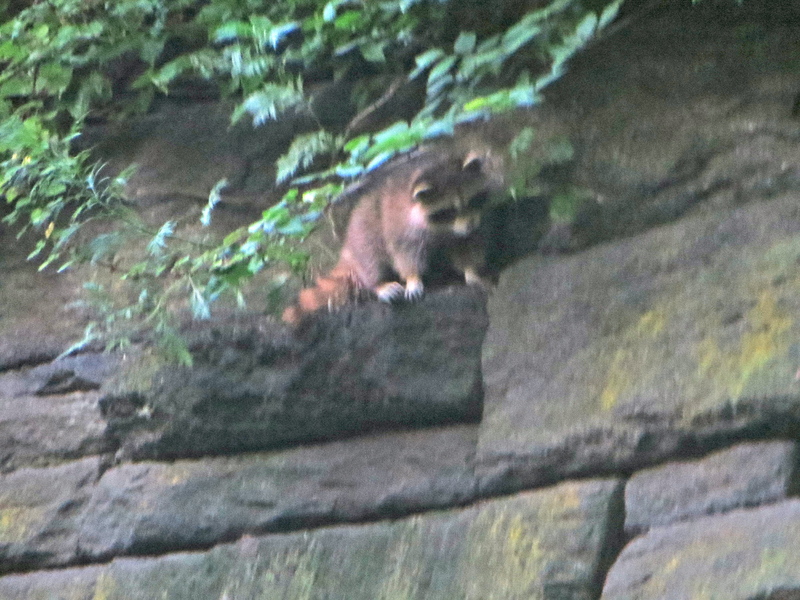 For much more on the raccoons of NYC, visit Out Walking the Dog’s Raccoon Archives. Nina’s lines from Act Four of The Sea Gull often spring to my mind in the anticipatory hours before a big storm. Scientists say that most storms have relatively little effect on wildlife at the species level, meaning a bad storm, even if it destroys many individual animals, is unlikely to permanently affect populations of species. 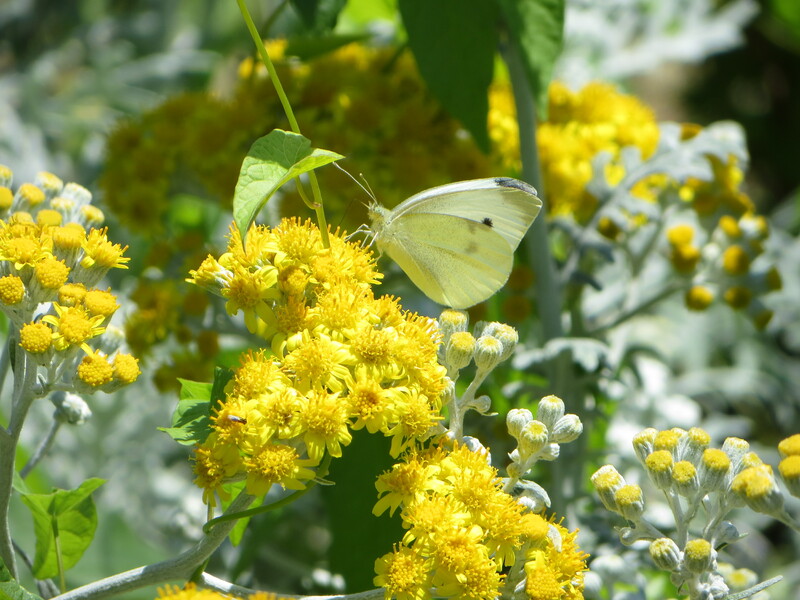 But thanks to anthropogenic climate change, we’re now seeing an increase in the number of “severe weather events,” from storms to droughts to seasonal changes that, taken together, are already affecting some species. Still my thoughts in a storm are not about the fate of a species, but about the suffering of individuals, animal and human. 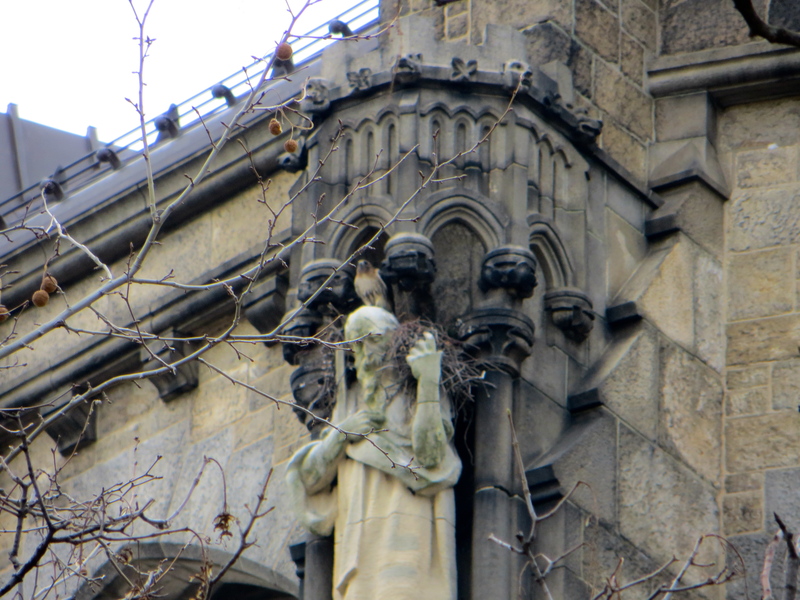 Luckily for our local wildlife, Hurricane Sandy is arriving well past nesting season. 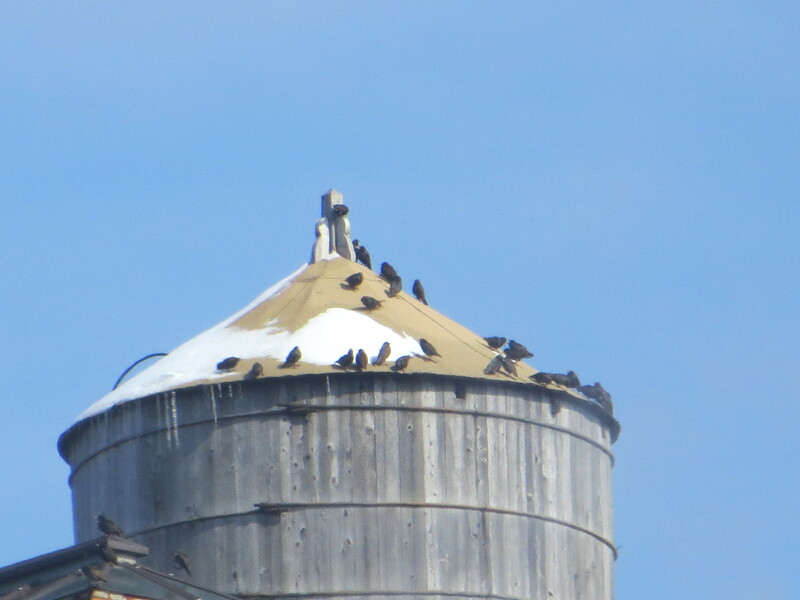 Most of our young animals are on their own by now, and many birds have already migrated south. 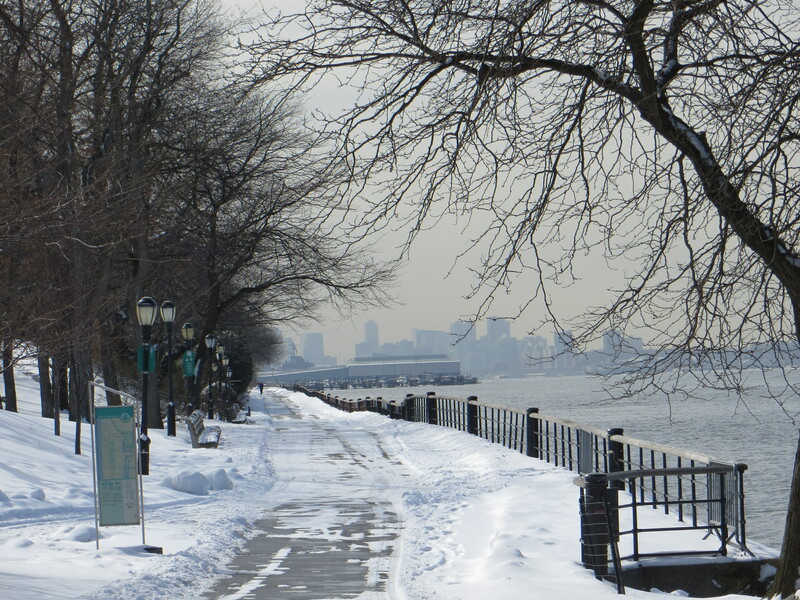 NYC’s resident wildlife will probably do pretty well, over all. 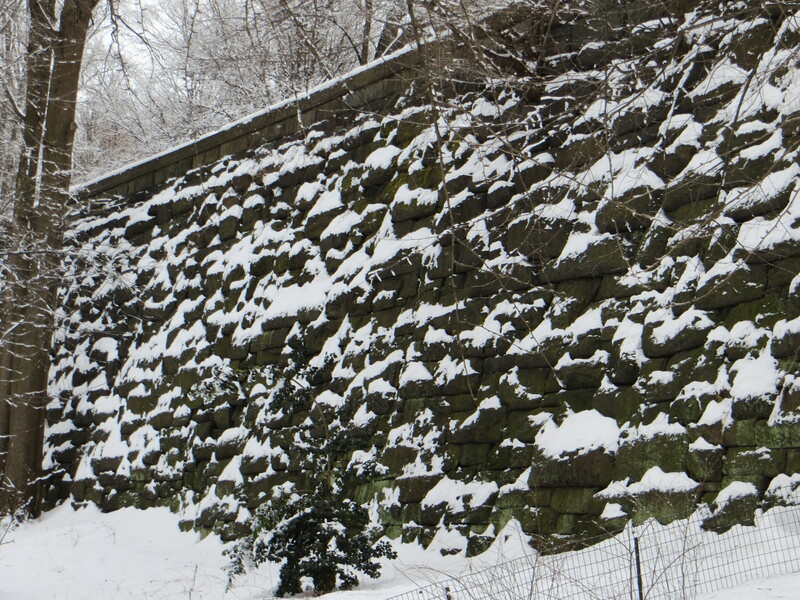 The raccoons of Riverside Park should be safe in their retaining wall. 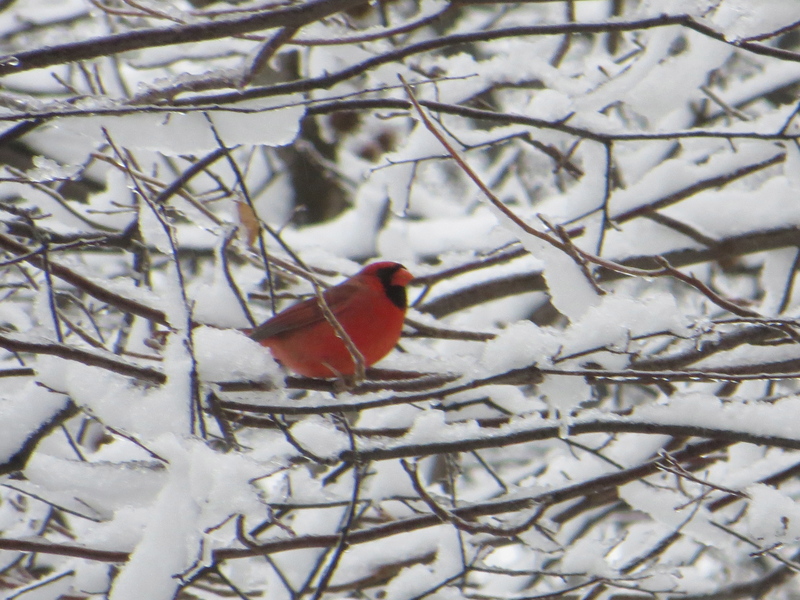 Songbirds will hunker down, lock their toes onto a protected branch, hold their feathers tight against their bodies, point themselves in the direction of the wind, and hold on for dear life as the wind blows past and the rain pelts down. 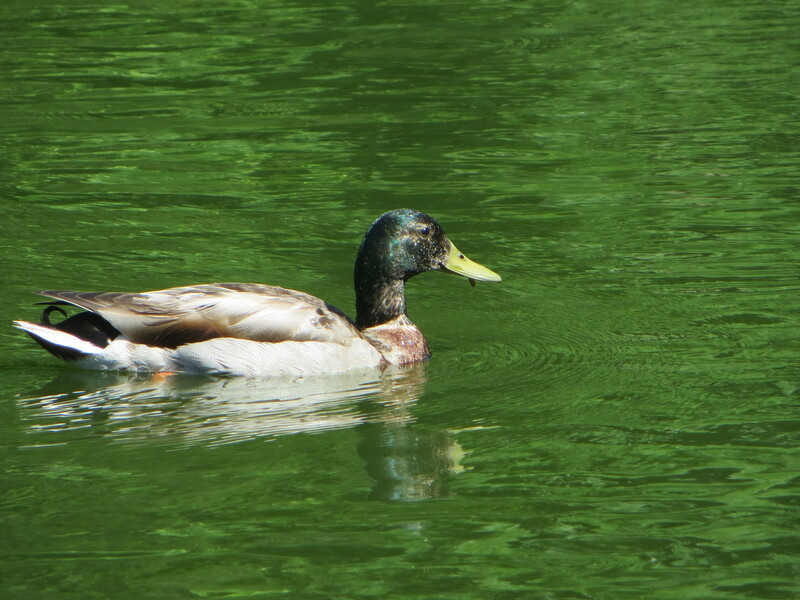 Feathers can effectively seal out water. 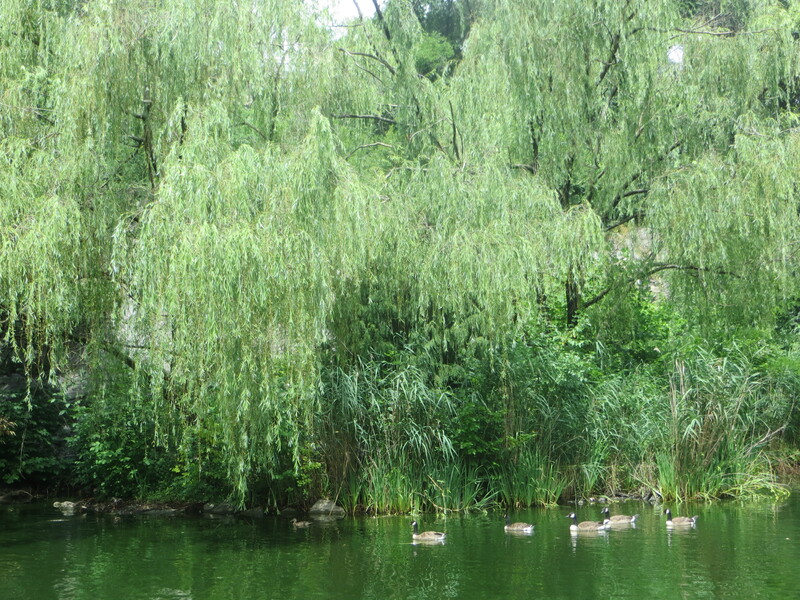 As long as the branch survives, the birds probably will, too. Cavity nesters, like owls and woodpeckers, are even better protected, tucked into natural holes in tree trunks. 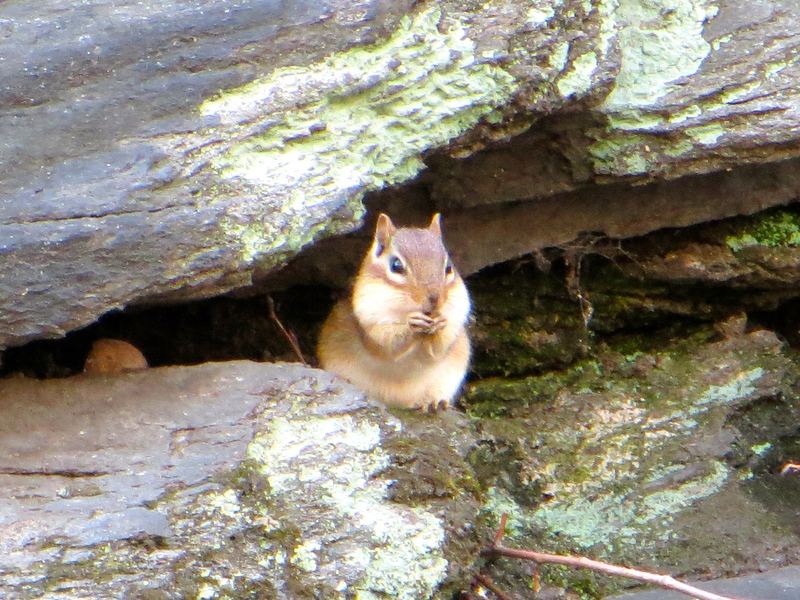 And squirrels, too, will find a hole in a tree or in the retaining wall, or they’ll burrow into their dreys, thick nests of leaves that they build high in the trees. If their tree withstands the storm, these creatures will emerge when wind and rain abate to fluff their fur and feathers, and search for food. 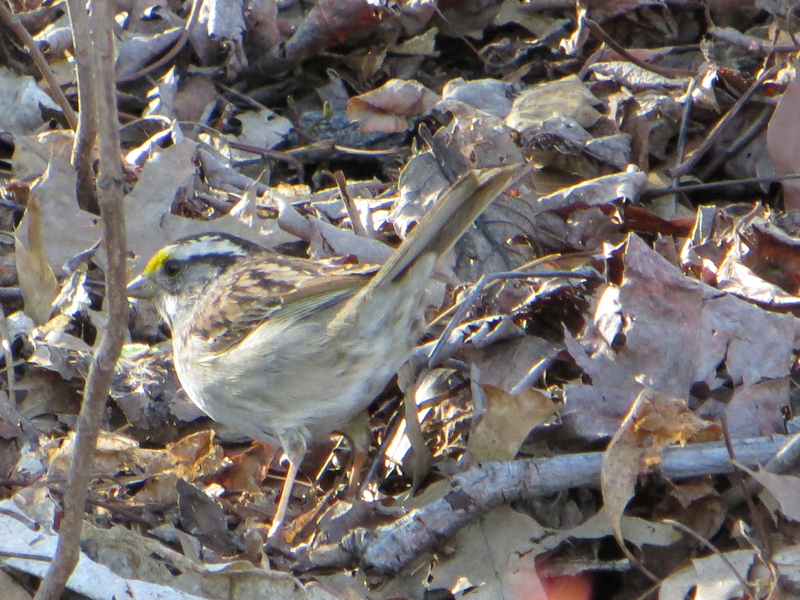 Migrating birds are more vulnerable. Exhausted by their travels, their energy reserves depleted, they must find food and shelter wherever they may be. Migrating birds may be blown hundreds of miles off course. Songbirds may be blown out into open sea where they can find no shelter or rest, while pelagic birds may be blown inland. 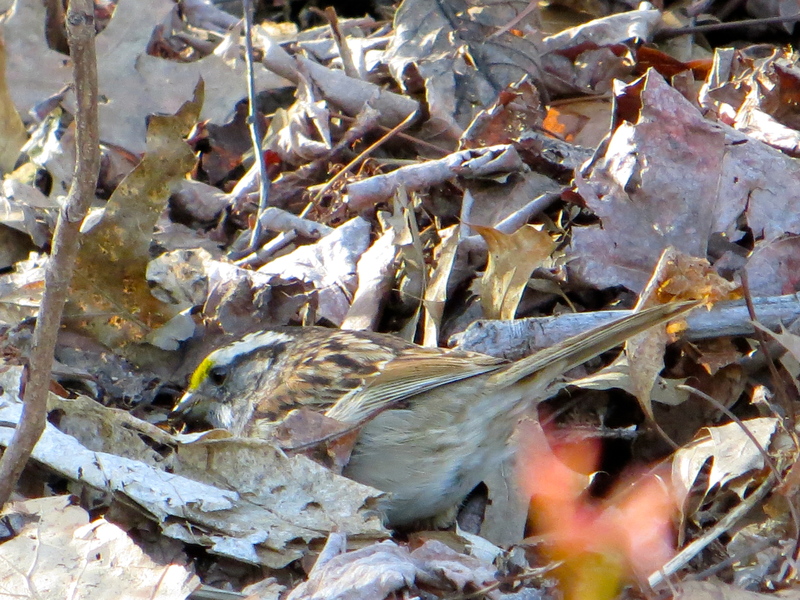 What may be a disaster for birds – being blown far from their native habitat – offers thrills for birders, who rush out into the aftermath of a storm to search for rare vagrants they might otherwise never encounter. Tonight in New York City, the wind is starting to gust, although the storm is still hours away. I look out at the strangely quiet streets from my cozy apartment, and hope that all creatures find shelter from tomorrow’s storm. Happy Valentine’s Day from Out Walking the Dog! 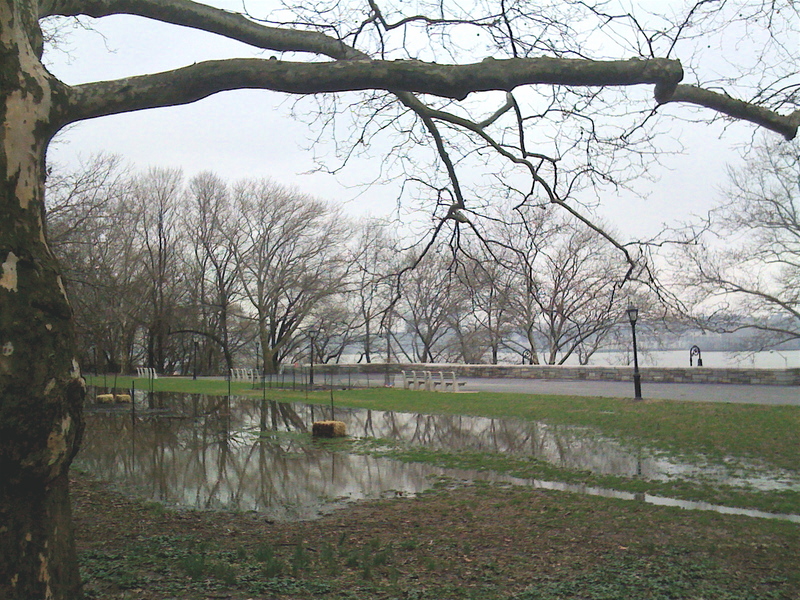 No animals are visible on today’s late afternoon dog walk in Riverside Park on the eve of Hurricane Irene’s arrival. Well, actually many animals are out, but only two species: humans and canines. No wildlife. Not a single bird or squirrel. Even the cicadas are silent, and the animal world seems to be tucked out of sight, quietly waiting, while over on Broadway, the humans scurry about emptying the local hardware stores of batteries and flashlights. The animals are still there, of course, curled into nests, dens and dreys just yards away from us walkers. They know how to disappear. They do it all the time. 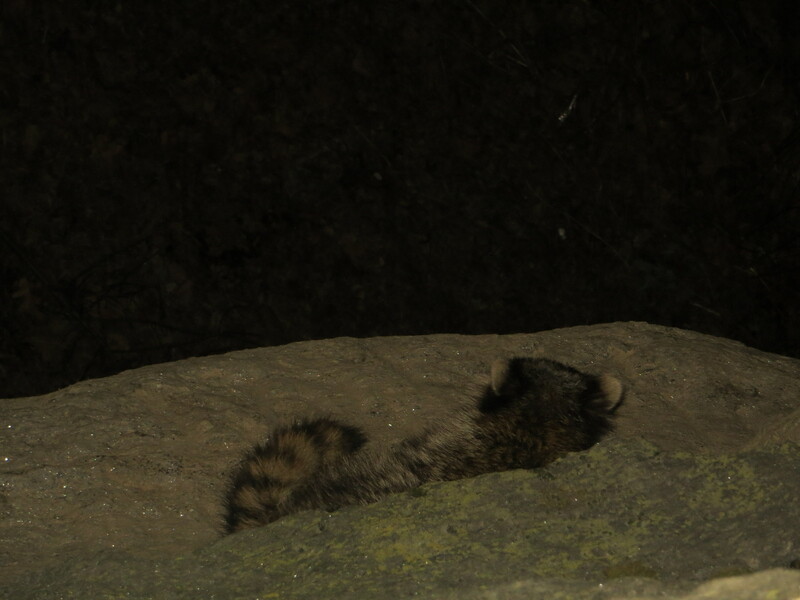 On Friday, a raccoon performed a vanishing act. And … hoopla! I’m back! Here’s hoping all the animals find safe haven and come through the storm safely. 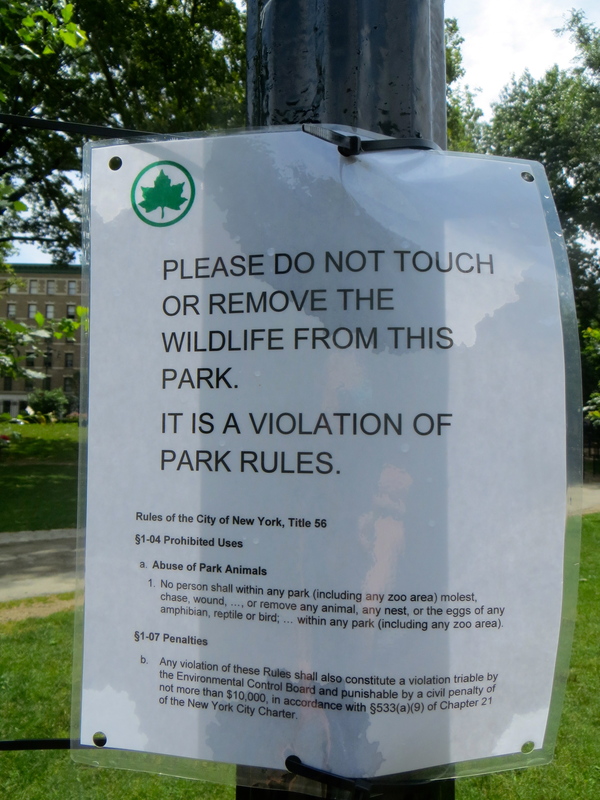 Strolling in Central Park with Esau yesterday morning, I was surprised to encounter dramatic new “Rabies Advisory” signs on lamp posts along the western edge of the park. 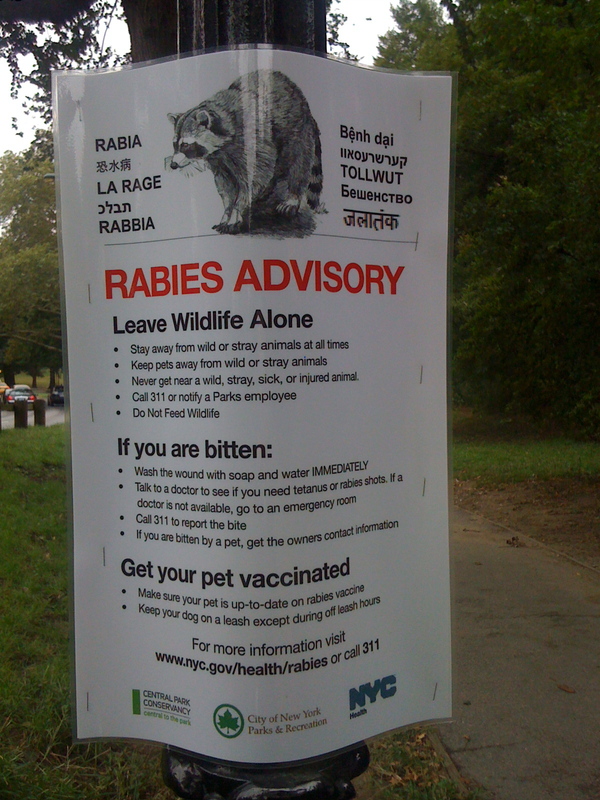 The new signs scream “Rabies” in multiple languages (La Rage! Rabbia! Tollwut!) and feature a realistic line drawing of a hulking raccoon that could probably hold its own as a National Football League center. The new signs are striking, easy to read and, well, kind of scary. But why scare us now? The epidemic appears to be mostly over, thanks to USDA’s humane and labor-intensive program to individually trap, vaccinate and release Manhattan’s healthy raccoons. Over 130 already-infected raccoons have died off since summer 2009, while the remaining, much-decreased, vaccinated population should serve as a barrier that prevents the disease from reaching epidemic proportions. After a monthly high of 38 reported rabies cases in March 2010, the numbers began to decline. 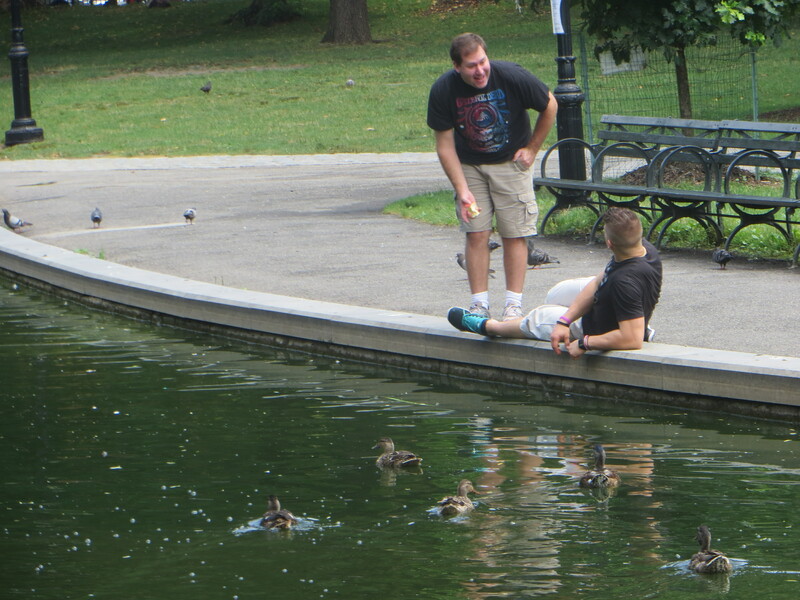 June and July saw three rabies cases each, and August became Manhattan’s first rabies-free month since November 2009. So I repeat, why the scary new signs? Well, it ain’t over till it’s over and with rabies these days, it may never be completely over. 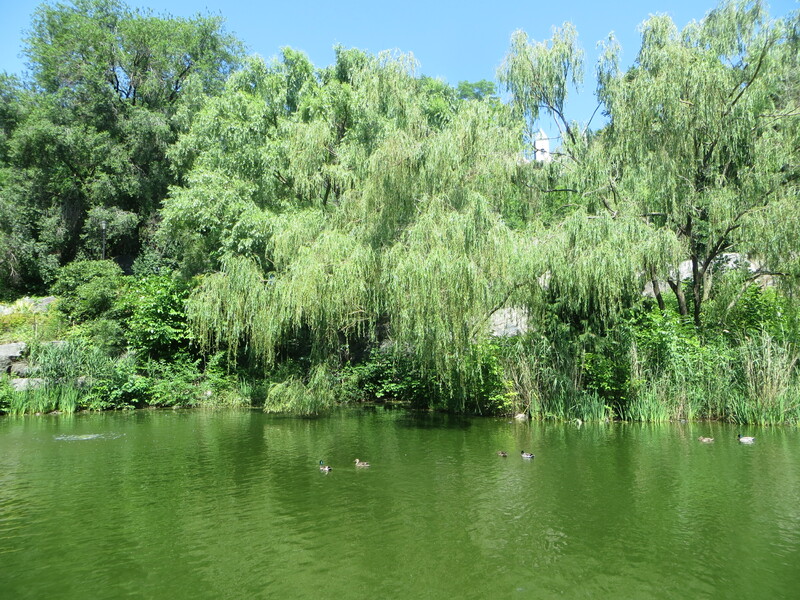 In early September, a single rabid raccoon was found in Central Park in the West 70s, reminding us just how difficult it is to eradicate a disease with a long incubation period. And to maintain effectiveness, we’ll probably need an annual vaccination program to ensure that new babies are trapped and immunized. But even if we were to succeed in immunizing the entire resident raccoon population, raccoon rabies is now endemic across the eastern seaboard from Florida to Maine. 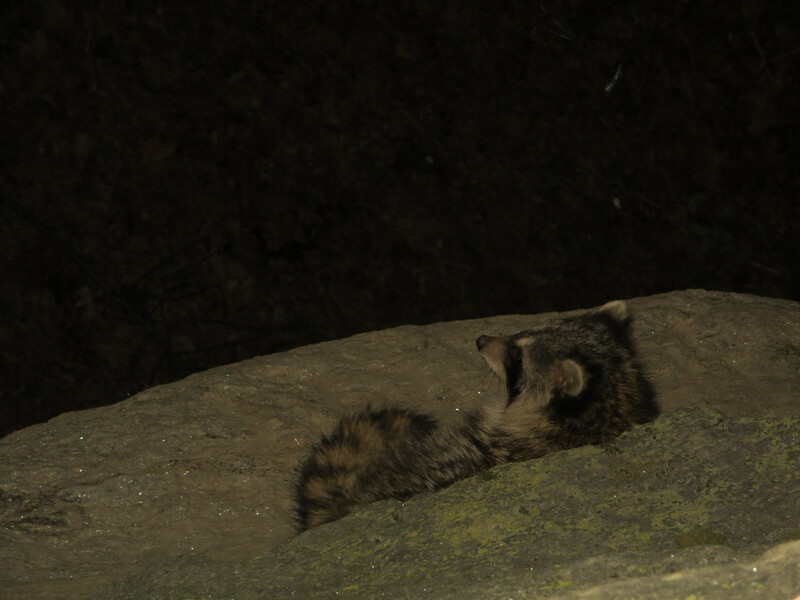 Raccoons and other wild animals, including skunks and coyotes, regularly find their way from the mainland to Manhattan, as juveniles seek new territory. 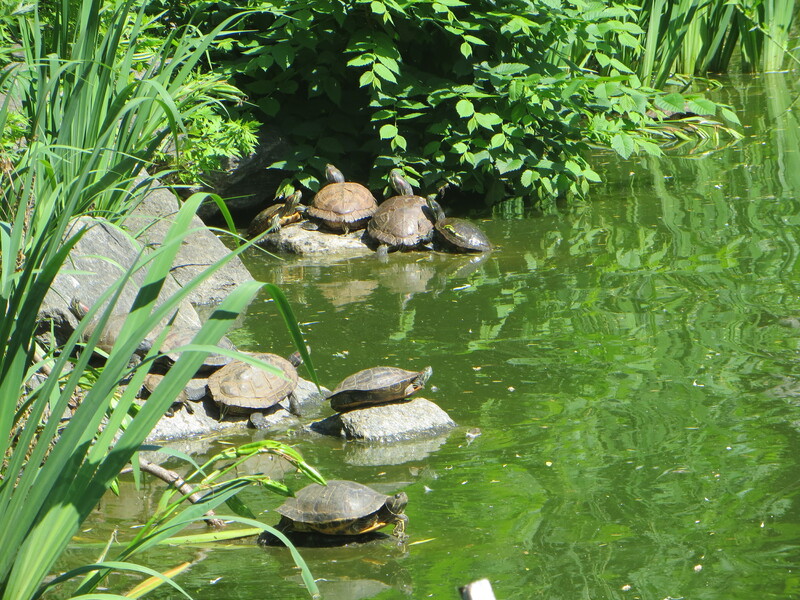 They cross the railroad bridge from the Bronx or swim a narrow channel. If in their travels, they have been in contact with a rabid animal, they will again bring rabies to our island paradise. 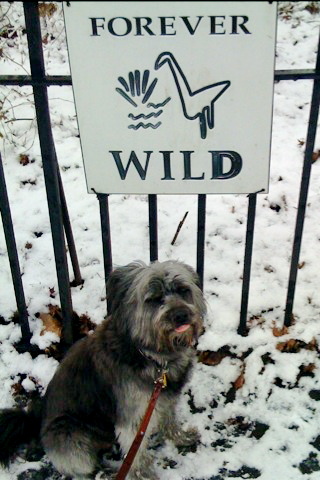 So heed the scary signs, and leave wildlife alone. 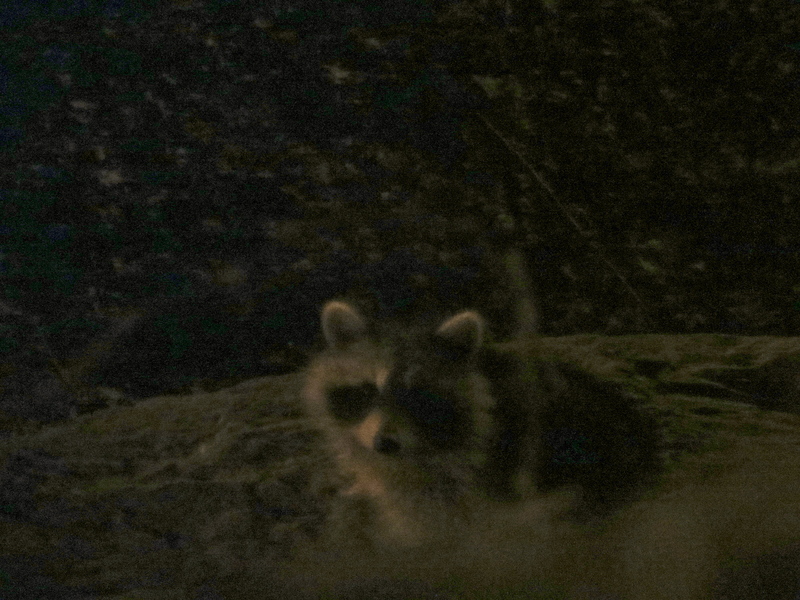 Enjoy the raccoons, but don’t feed them or try to lure them closer so you can get a better photo. 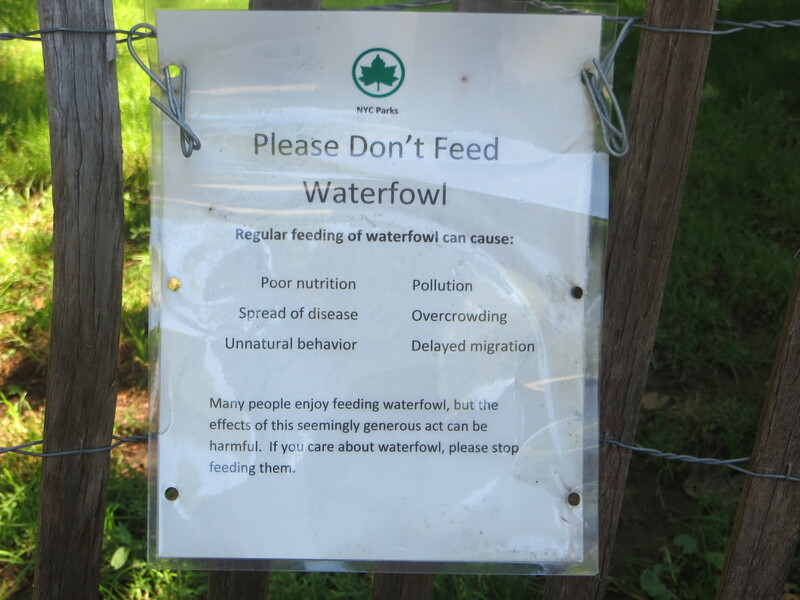 And while we’re at it, it’s probably better not to feed any of our urban wildlife, except maybe small migrating songbirds. 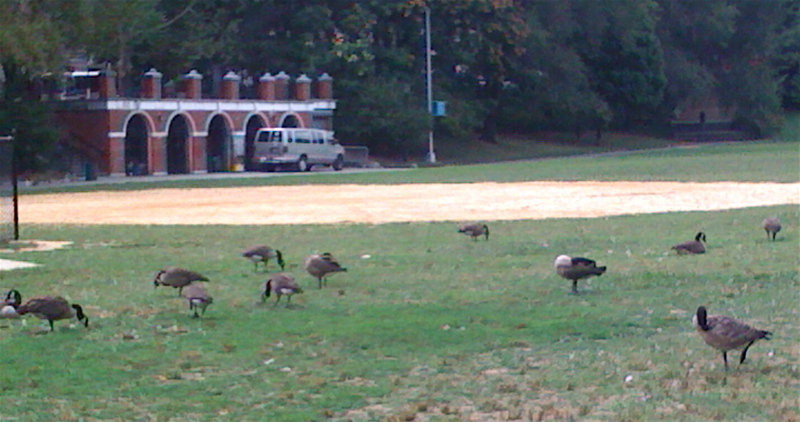 Feeding by humans encourages animals to overpopulate, which makes us consider them pests that need to be eradicated, as in this summer’s killing of geese in Prospect Park. Unnaturally dense populations allow disease to flourish and spread. So if you have a soft spot for geese, raccoons, pigeons, squirrels and other urban wildlife, do the animals a favor and stop feeding them. 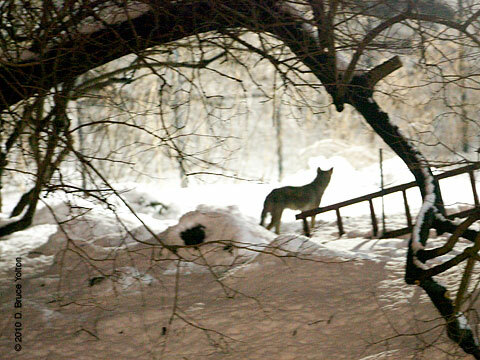 Welcome or not, coyotes will be back in Manhattan. 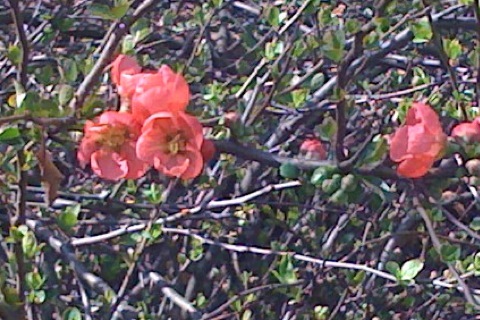 If not this winter, then next. 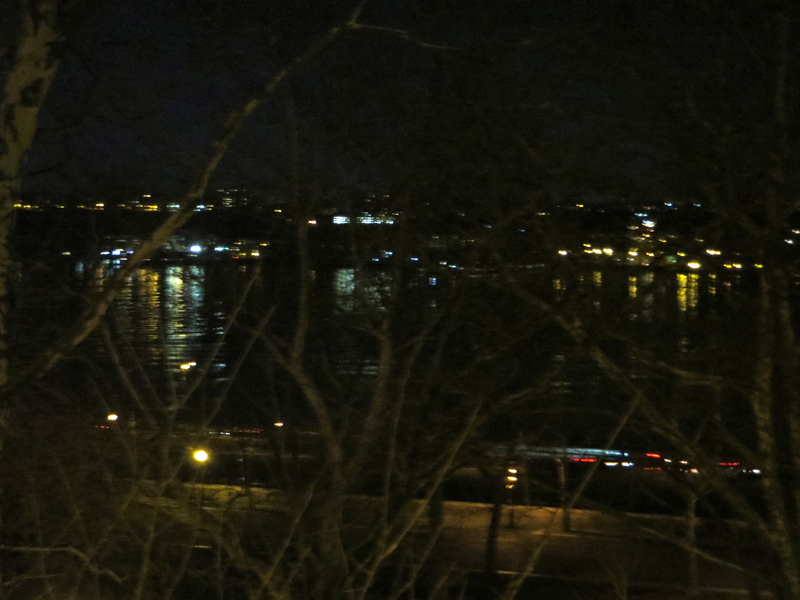 They may be here already, slipping through the old growth of Inwood Park and the tangles of Highbridge. 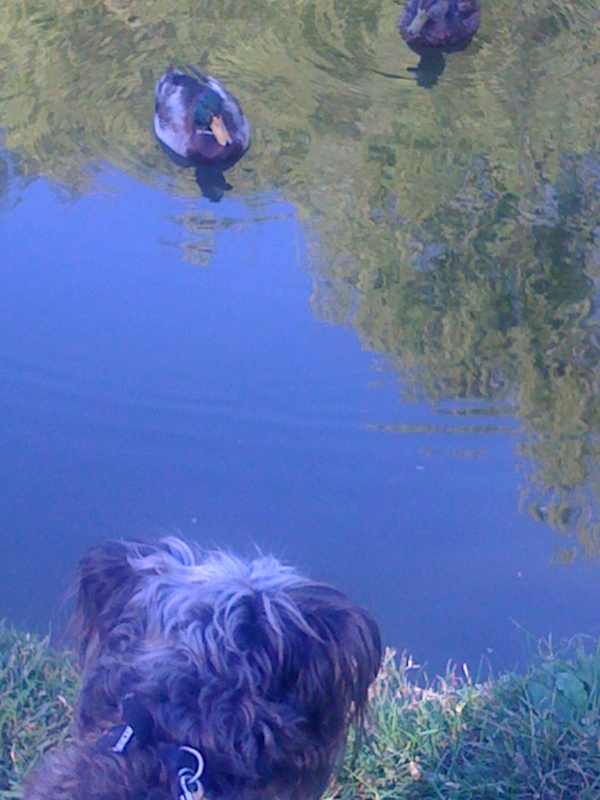 Esau contemplates ducks as a possible food source. 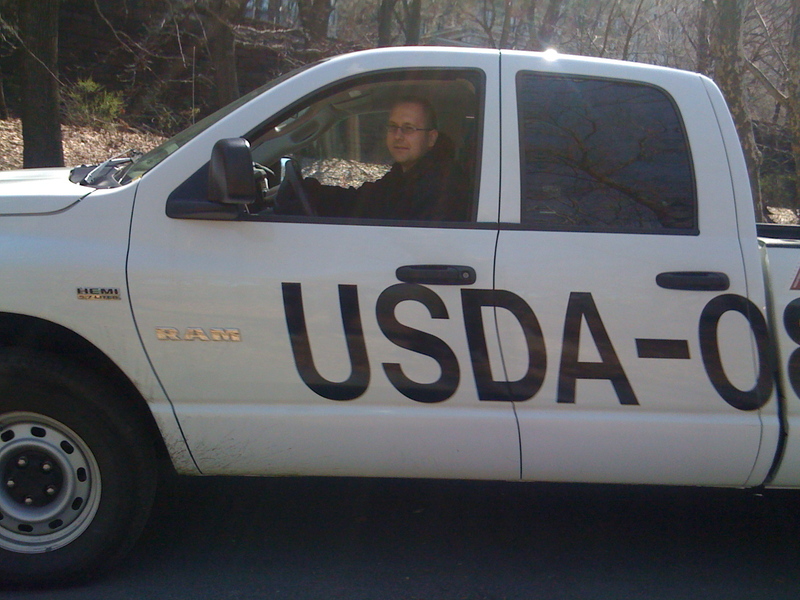 USDA truck holds answers to many questions. Find out why yesterday’s sighting of a USDA truck is cause for rejoicing. 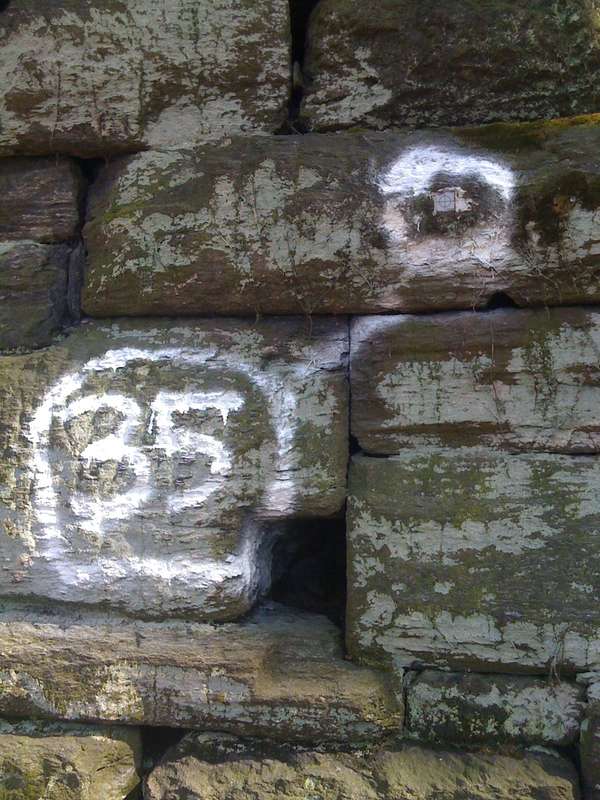 But first, strange markings appeared last week on the retaining wall and nearby path. With my wildlife-obsessed outlook, I speculate that the circled numbers and targets have something to do with the raccoon vaccination program. But what? 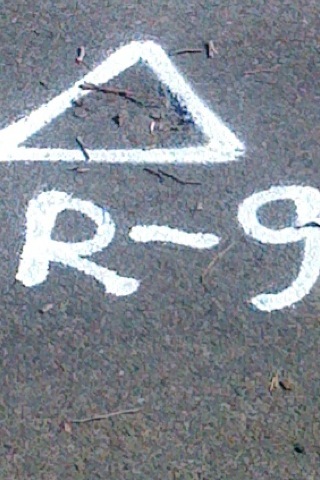 Do the markings indicate that trapping and vaccinating has begun in Riverside Park? Do they show where raccoons are likely to be found? The park is cool, bright and windy. 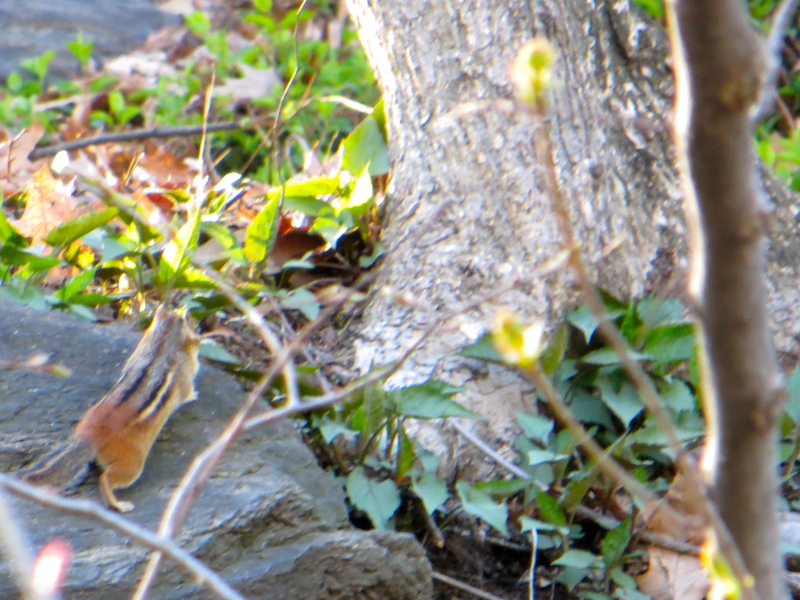 Here and there the pervasive brown of winter yields to color. 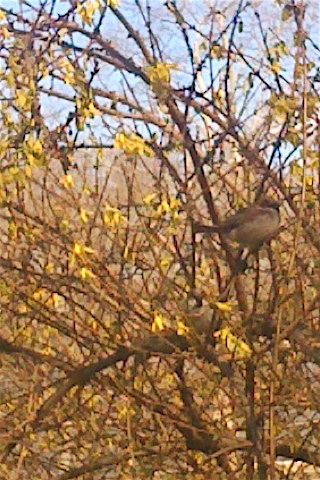 Sparrows huddle in forsythia bushes, puffed up like little balloons against the wind. 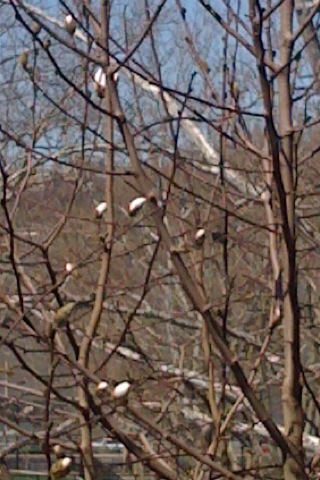 Magnolia buds prepare to pop. 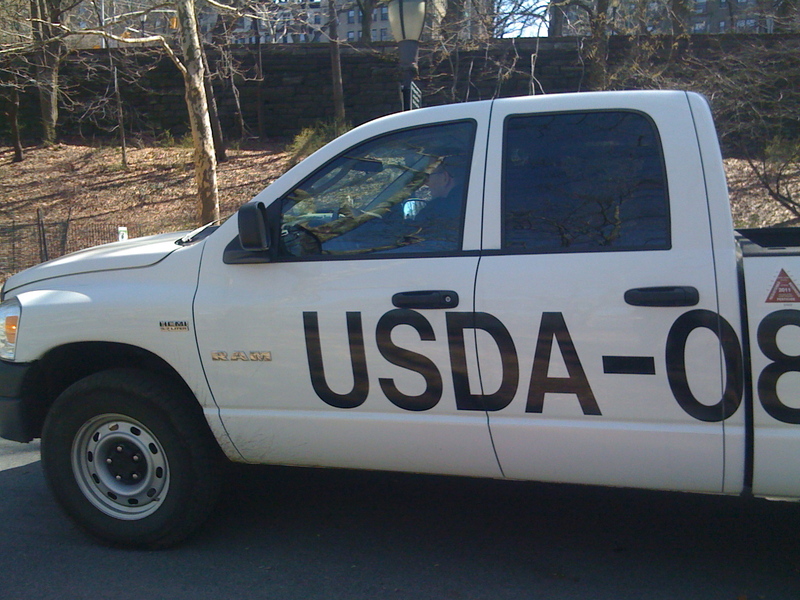 Suddenly, up ahead on a pathway, we see … a USDA truck. You have to understand. 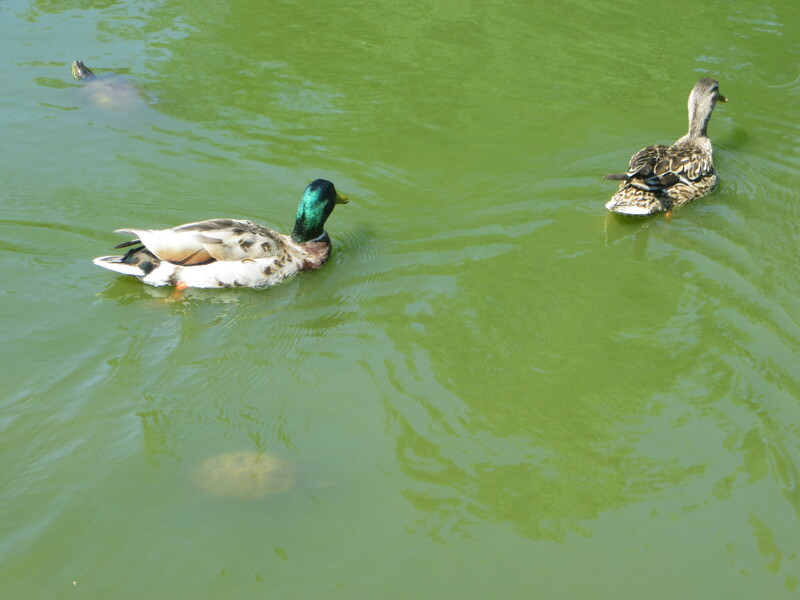 USDA is handling the Trap-Vaccinate-Release program for the city. If anyone can answer my many questions, USDA can. Earth-shattering questions, like: How is the program going? Any estimates on the Central Park raccoon population? How long will it take to know if the program is succeeding? Any new theories on why the disease took such vehement hold this year? Esau and I run after the truck. But it gets away. Saddened, we trudge toward home. Then, half a mile north, it suddenly reappears. We run. We wave our arms. The truck stops. The window rolls down. Success! We speak briefly with the driver through the window. 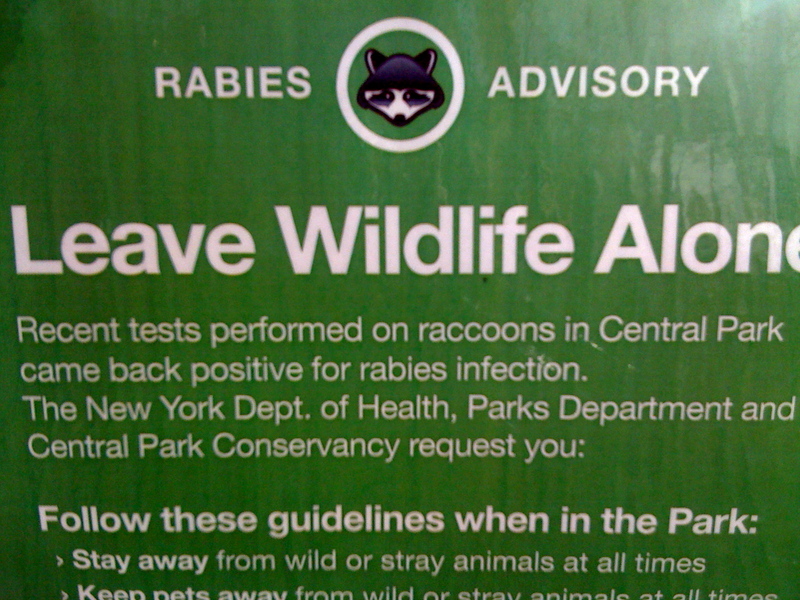 A USDA biologist, he confirms that the Riverside Park phase of the raccoon vaccination program began on Tuesday. The markings on the wall have nothing to do with the raccoons. He seems to need to get back to work and offers his card for a follow-up conversation. We sing as we head north, happy to have even a little more information. At 108th Street, we discover the Man Behind the Marks. 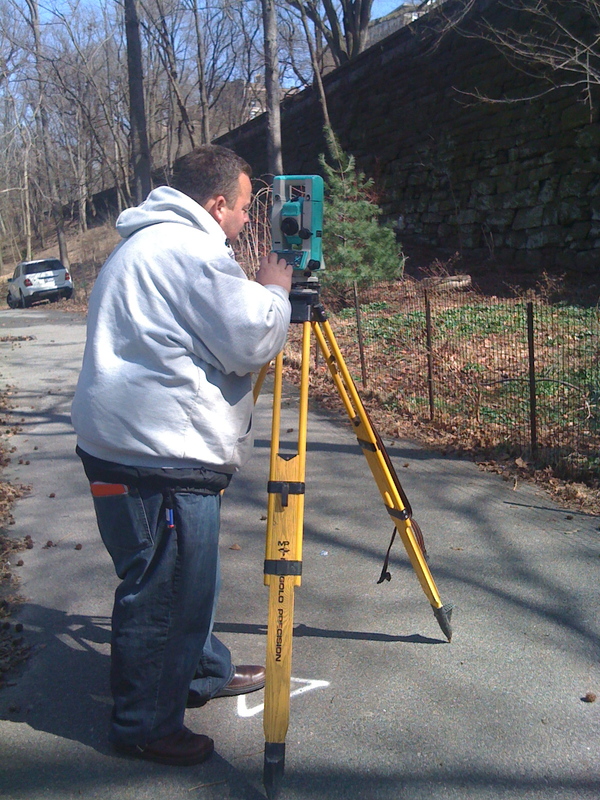 He’s keeping park-goers safe by surveying the retaining wall for structural weaknesses in hopes of preventing problems, like the collapse of the retaining wall that closed the West Side Highway for three days in 2005. 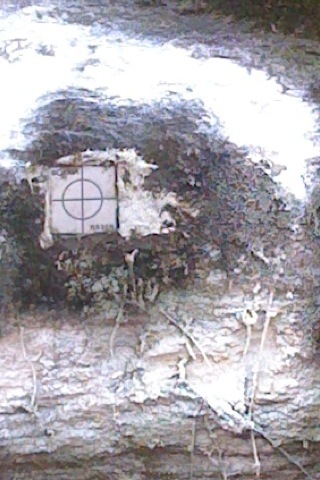 The marks and targets help him line up his equipment for accurate readings. The targets are always there, he says. 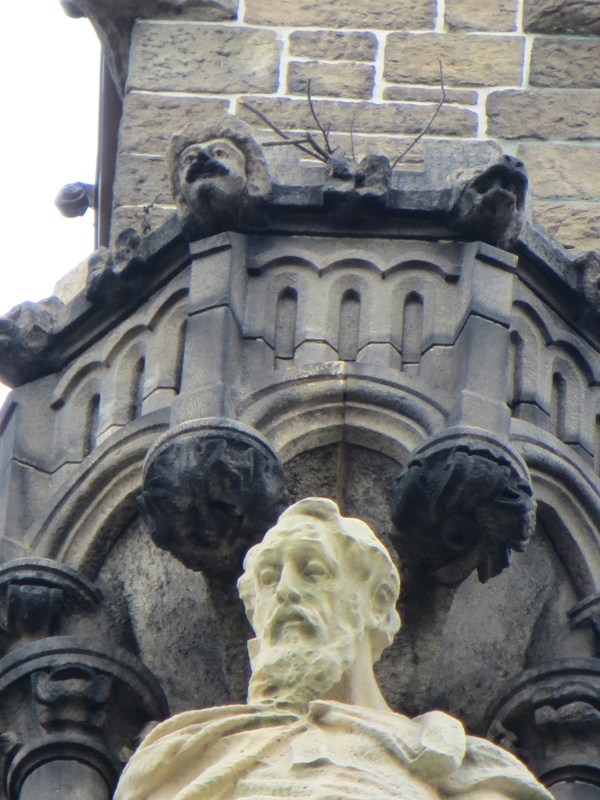 He recently freshened up the paint, which is why we suddenly noticed them. 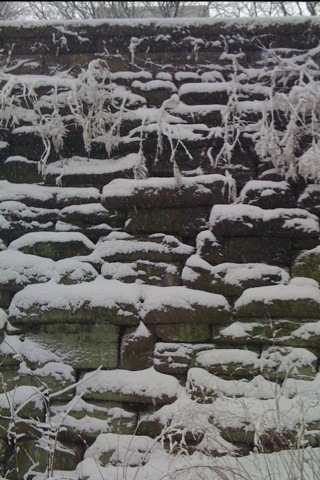 Snow-covered retaining wall from just a few weeks ago. Beautiful. 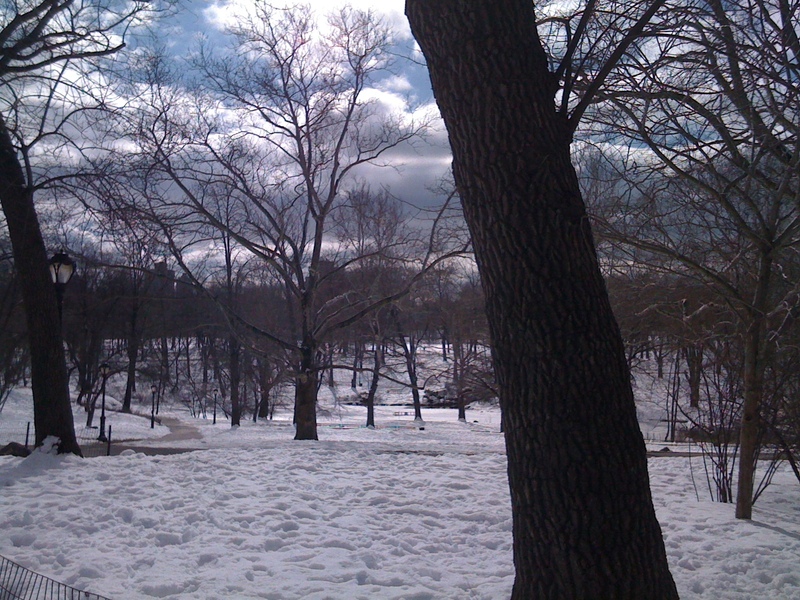 I See the Central Park Coyote: Joy! Yesterday I managed to get down just after sunset to the Pond at the southeastern end of Central Park to watch for the coyote. Photographer Bruce Yolton was already on the bridge with his big camera set up. 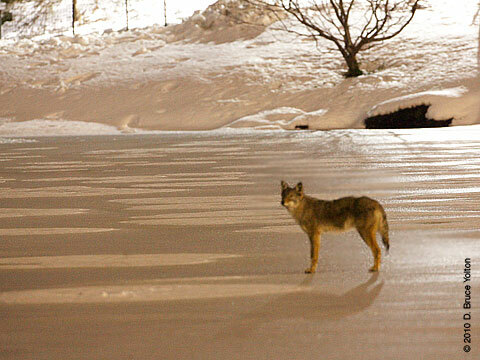 He said the coyote had been out on the ice about ten minutes before, but had left. We waited. I walked a slow loop around the Hallett Nature Center and the pond, staring into the dusk, hoping to see the coyote on the other side. No luck. I rejoined Bruce on the bridge, and we waited some more in the gathering dark. Two pitch-black shapes flew past us, low and swift. 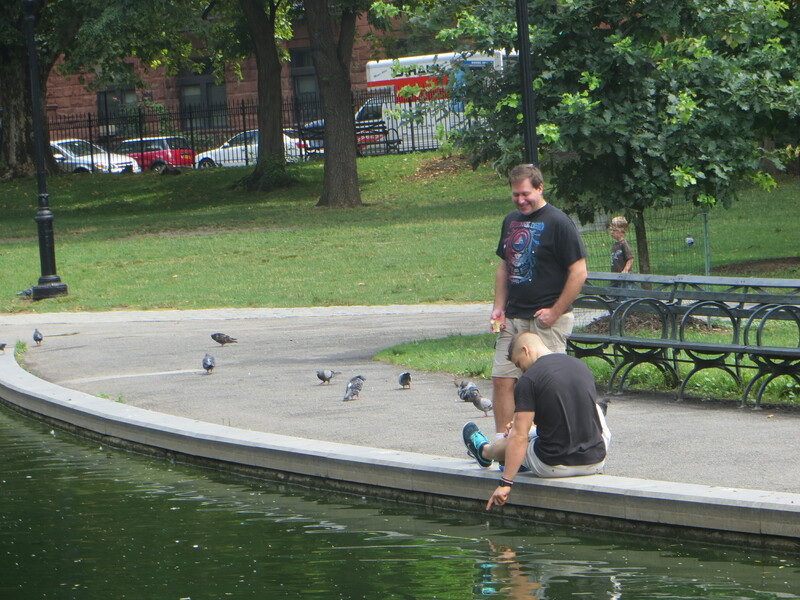 “Ducks,” Bruce said. They joined their tribe in the water under the bridge. 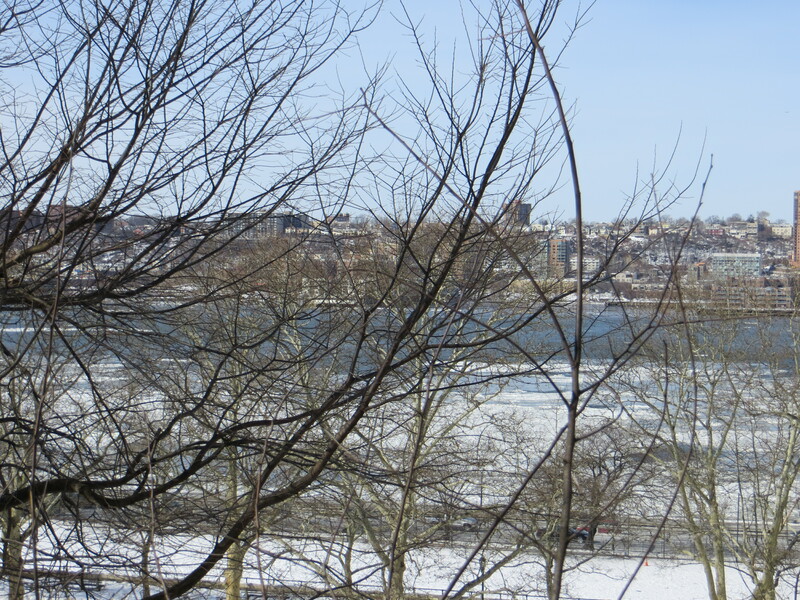 And then I caught a slim shape moving along the little spit of land that juts out onto the ice. The coyote! 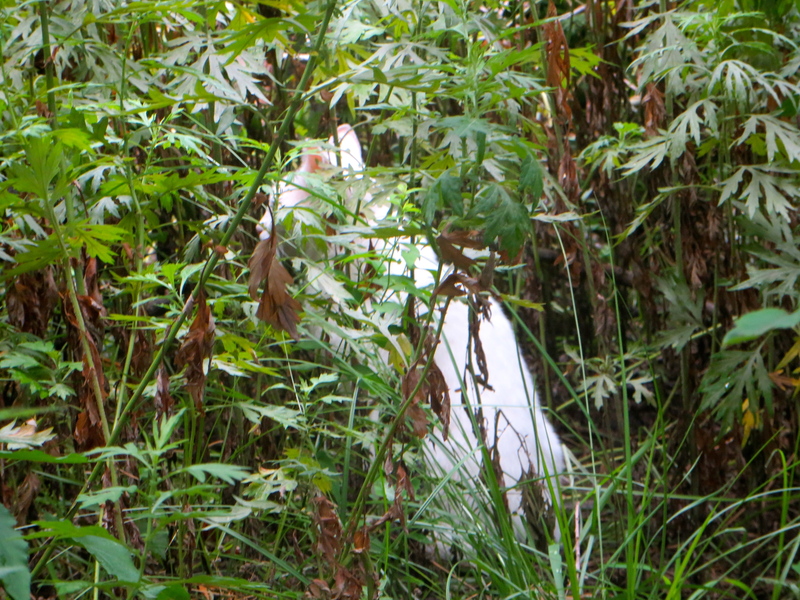 It disappeared around the far side, so we moved around the path after it. We were able to watch it for quite a while. It came out onto the ice many times, trotting and occasionally breaking into a lope. Its trot is remarkably quick and its movements efficient. Once it made a grand, pouncing leap from the bank back to the ice. Wary and shy, it slipped back into the sanctuary at the sound of loud voices. It seemed to be trying to find a quiet space through which it could move on out of its Hallett-Pond territory, but was constantly deterred by people walking their dogs, loud ice skating music on the nearby rink and other evening park activity. How different it must be in the wee hours of the night, when the park is empty of humans and dogs, and the coyote has free run. I’d like to see that. See more photos and a short video of last night’s coyote sighting at Urban Hawks. 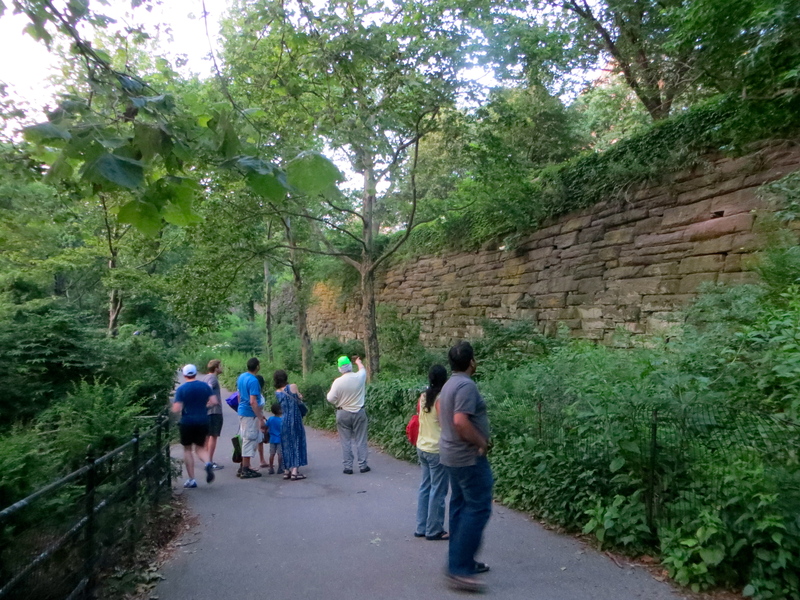 The Central Park coyote is still here. 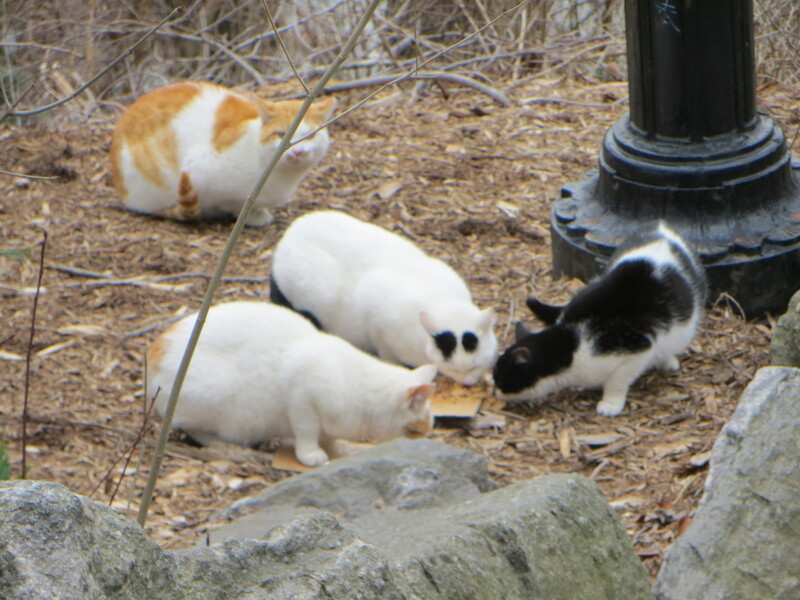 No further word on the three Columbia University animals. 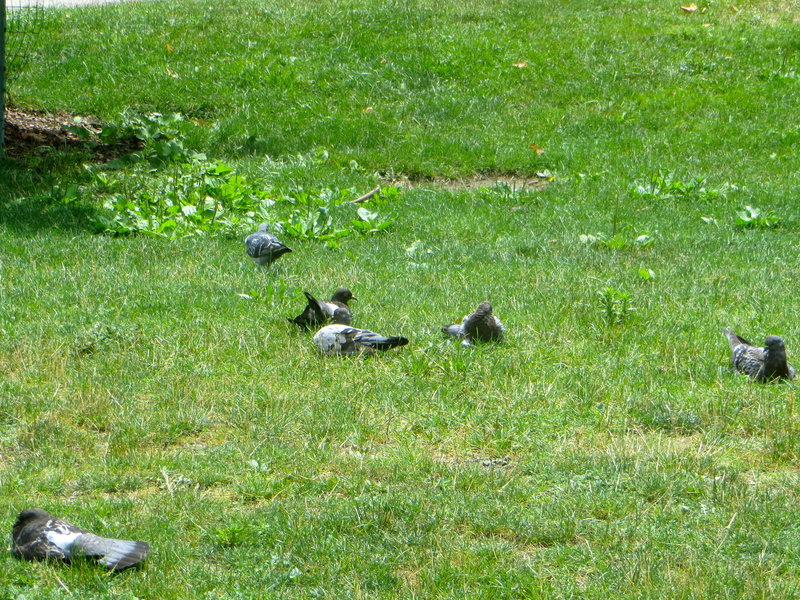 They seem to have melted into their city surroundings. 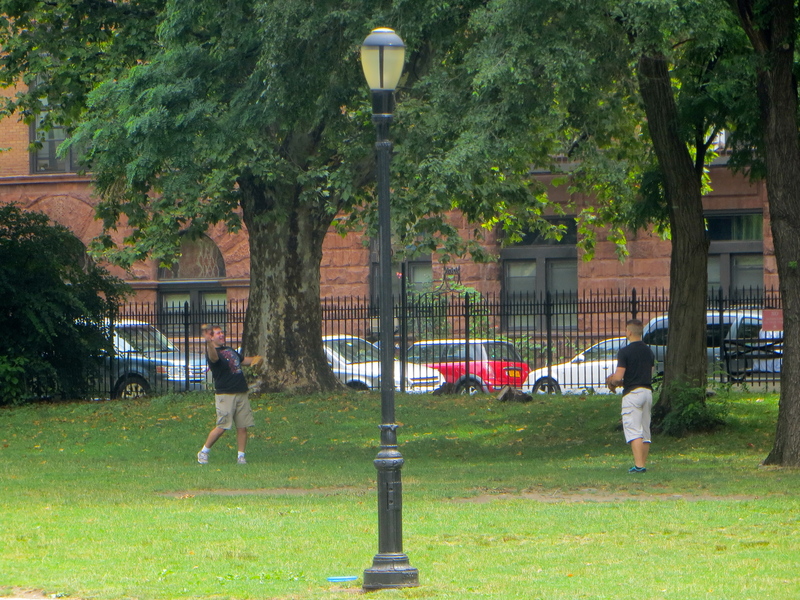 They may have made their way to a park. 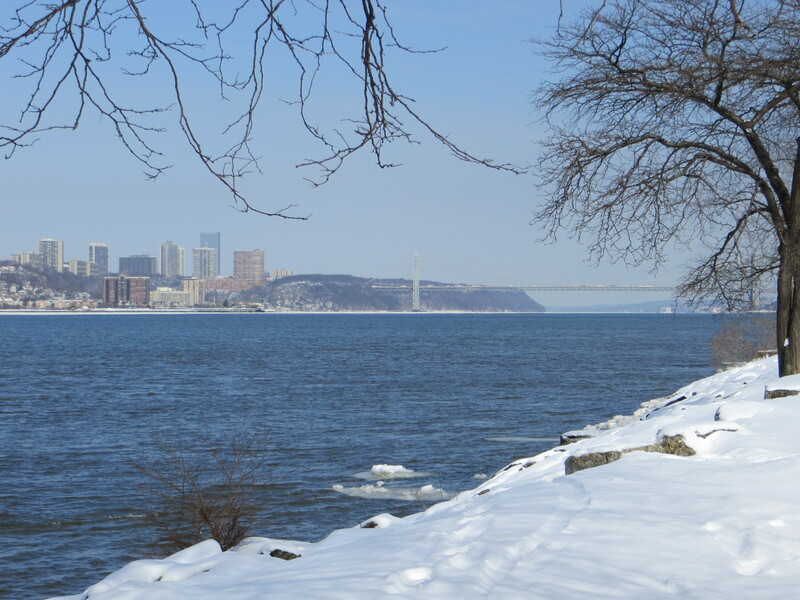 On February 13th, a coyote was spotted at Highbridge Park up at the northern end of Manhattan. 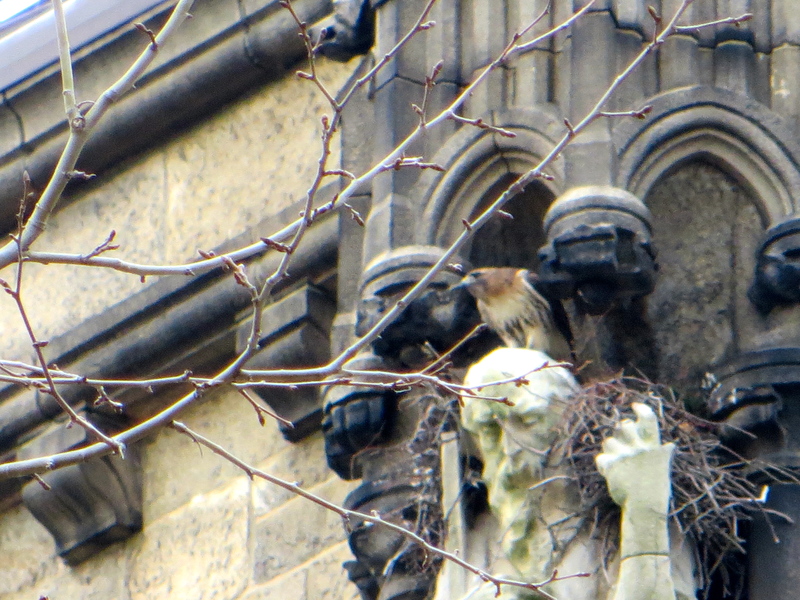 Is it one of the three Columbia coyotes or is it yet another visitor? No one knows. But it’s clear we have at least four coyotes on the island. 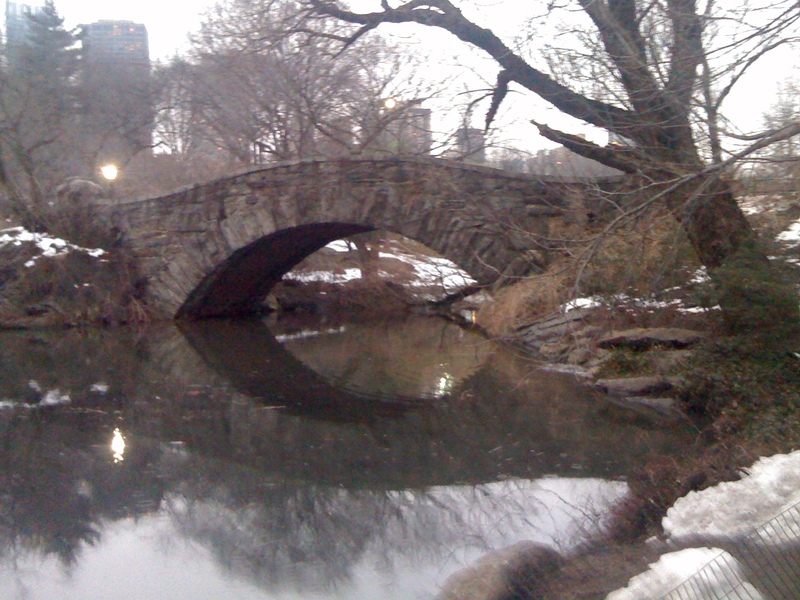 The Central Park coyote has been seen most often on the frozen Pond at the south end of the park, near the Hallett Nature Sanctuary. 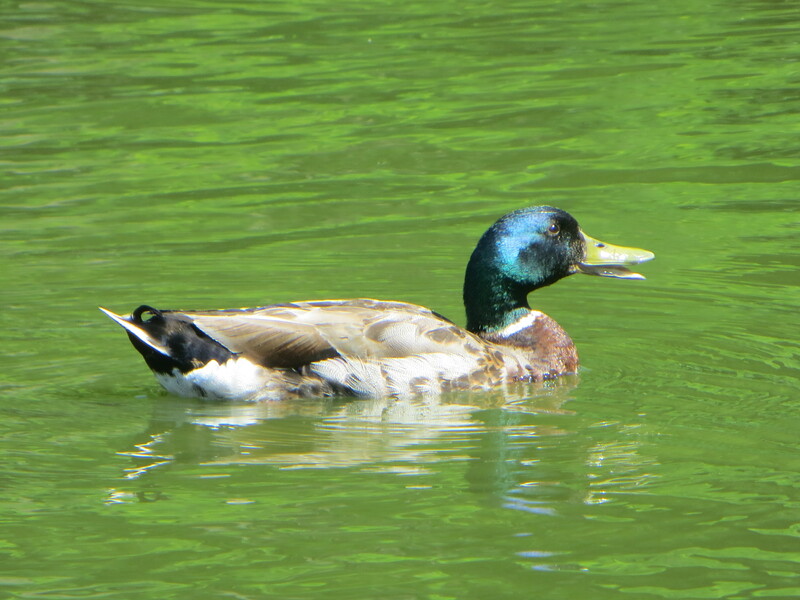 Hallett is a four-acre wooded area that is closed to the public to protect wildlife. The coyote has also been seen at numerous locations in the park, including the Great Hill and the Pool up at the northern end. I imagine that in the quiet of the night and early pre-dawn hours, our coyote can cover the entire park with ease. 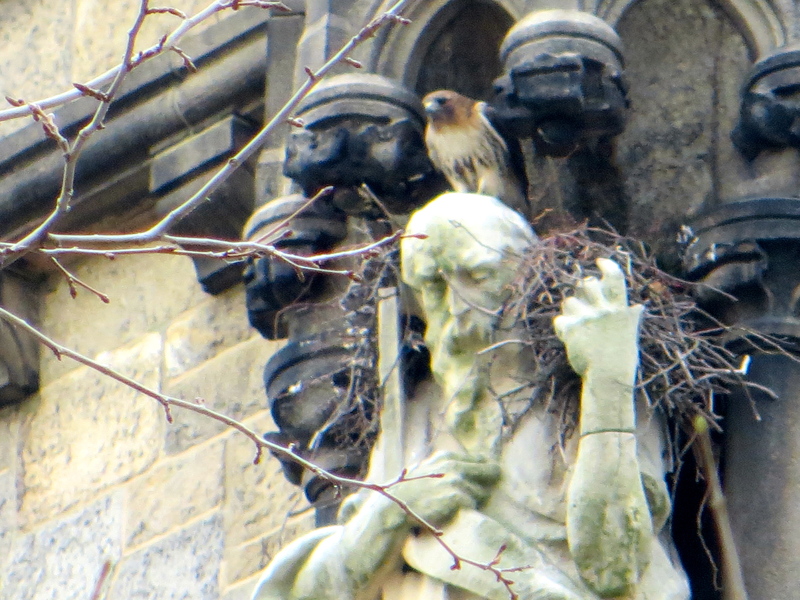 Visit Urban Hawks to watch the video and see new photos. Then check back at “Out walking the dog” to read the start of a series on urban coyotes that will eventually include a little history on the Eastern Coyote, speculation on why they’re moving into these mean streets and what the future holds for city dwellers, both human and wild canid. Meanwhile, remember: LEAVE THE WILDLIFE ALONE! 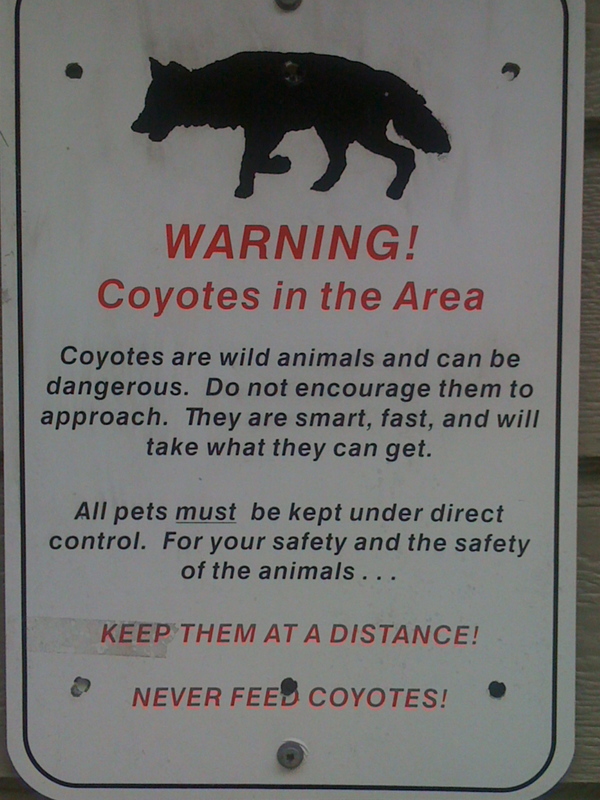 Don’t approach or feed our coyotes or raccoons. 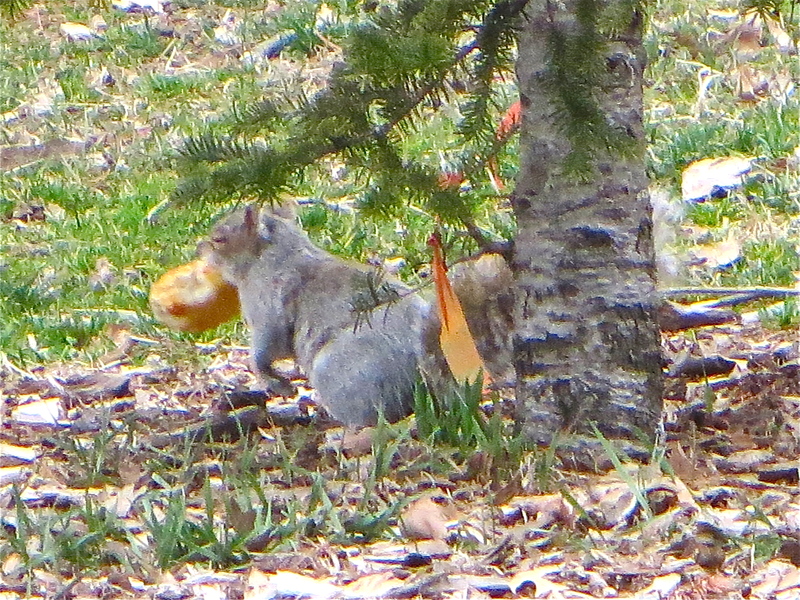 Most problems – forget the rabies for a minute – stem from humans providing food for wild animals. Animals then lose their natural fear of us, look on us as a food source and become bold and demanding. But hey, even Esau gets that way when people give him too many treats.